Dubai-based developer, Global Realty Partners, has finished casting the final slab of their latest mixed-use project located in Arjan and will start handing over units this December. The building – still to be named – will comprise six prime retail units and 88 apartments, including studios and one-bed formats, ranging from 42 and 100sqm. Amenities include a fully equipped gym, indoor lap pool, steam, sauna, and sensory experience shower areas. All units will come with German engineered wardrobes and cabinetry, soft-closing doors, and Grohe bathroom fixtures. The building will further differentiate itself having used the Dubai Municipality’s newly established Green Building Standards including a proposed green roof, bicycle parking, electric vehicle parking, and low-flow water fixtures. 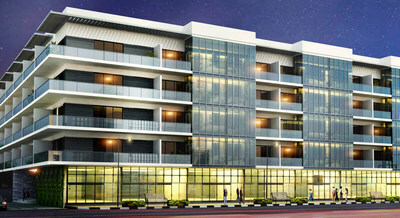 The building is situated on the major Umm Suqeim and the Sheikh Mohammed Bin Zayed (E311) arterial road corridors. Gulf Global Group, parent group of Global Realty Partners, was established in 2002 by Arshad Wahedna, a first-generation entrepreneur, to invest and consolidate an international asset base. The group has successfully invested, developed, and participated in various joint-venture developments in excess of $250mn. The group has previously participated in completed projects including The Palladium Tower in the Jumeirah Lake Towers district and the Lamborghini Building on Sheikh Zayed Road.